Pantopon - ZineWiki - the history and culture of zines, independent media and the small press. 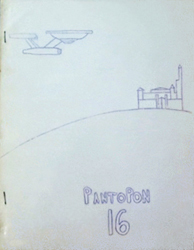 Pantopon was a science fiction and media science fiction fanzine by Ruth Berman. Pantopon was published in Minneapolis, Minnesota, U.S.A. the 1960s. It was an Apazine for the Fantasy Amateur Press Association (FAPA). Nineteen issues were published. Issue 2 appeared in August 1961; issue 5 in May 1962; issue 11 in February 1965; issue 12 in May 1965; issue 13 in November 1965; issue 14 in February 1966; issue 19, the last issue, in November 1967. Issue 16, from February 1967, featured the story "Star Drek" by Ruth Berman which was later reprinted in Spockanalia #1. Issue 17, released in 1967, featured the story "Kirk and Spock" which also appeared again in Spockanalia #1. In the late 1950s, Ruth Berman had co-published All Mimsy with Eleanor Arnason and Ron Whyte. In the early 1960s, she began publishing NeoLithic and Dinky Bird. Later in the 1960s she published Inside Star Trek, one of the few fanzines to appear during the original run of the television series, followed by her next Star Trek related fanzines, T-Negative and The Star Trek Songbook. In the 1960s and 1970s, Ruth Berman was also publishing the Sherlock Holmes anthology, SH - sf Fanthology. This page was last modified on 16 March 2018, at 13:28.